Heavenly blog! : No. 1051: I've only written a small fraction of what I know about Jan Aage Torp's life and ministry then here opens up an ocean of evil, hatred and conflicts! No. 1051: I've only written a small fraction of what I know about Jan Aage Torp's life and ministry then here opens up an ocean of evil, hatred and conflicts! I've only written a small fraction of what I know about Jan Aage Torp's life and ministry then here opens up an ocean of evil, hatred and conflicts! I do not mind Torp, I want only one thing, that the case is dropped in spite of everything what he has called me and made by criminals and unbiblical actions. Police have taken to their senses? For the first time in this matter? Before Jan Aage Torp came with his fictional review of me for 1 year ago where he hated me and my preaching about divorce and remarriage, so I did not know so much about Torp that I know today! What is the truth is that I have only written a small fraction of what I know about Jan Aage Torp's life and ministry then here opens up an ocean of evil, hatred and conflicts! That he attacks me like he does is obvious that he really must hate God and themselves. Had a loved himself, so had a rose above such things as I came with the pros. But beginning a little exploring on Torp, so have not really his entire adult life, fighting with everyone and everything, even his own family, he has hated and my upstairs at. Yes, you read right, so he believes that he is the so-called "innocent" after he was divorced that are allowed to remarry. Only it says that he is a fool last and psychopath, and what did he do after he went with a fictional review of me? Then he wanted me two years in prison, Torps hatred knows no boundaries, it is far beyond what most! It has both been hurt, interesting and educational! There are so many things to Torp which I could have written about, which I have not done and can not go on. It has been a journey in malice, deceit and disguise really who we are. This is what I've found out that I had, and which I have now come a long way with, that I know who Torp is and what he stands for and who he really is as a person. I have not written much about his Apostel service and another, there has been so much else. But he writes about himself that he is Jan Aage Torp in 2013 granted the title of "convening Apostle" for all of Europe within the organization "European Coalition of Apostolic Leaders (ECAL), which falls under the International Coalition of Apostolic Leaders (ICAL), an association of leaders within a branch of the charismatic movement often referred to as the "New Apostolic Reformation". 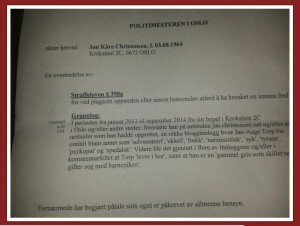 Jan Aage Torp and his corrupt and totally mislead community believe that apostle and prophet-office originally had been lost in the history of the church, and that these offices or service has been restored in our time there Torp is a leader for all of Europe. Although not Anders Behring Breivik thought so large and narcissistic about themselves, and this man defends Oslo police, this is insanity at its very worst! More pompous and foolish than Jan Aage Torp is, it is possible and all this in God and the name of Jesus? No, I go gladly into prison for having warned against than as arch-villain and false apostle. Suddenly he runs out spirits by police and others? He would drive out demons by Anders Behring Breivik as he writes that I am sympathizer of. A onderere and more deceitful man than Torp, a long sought. The police claim that I have spoken so bad about Torp, but the truth is that he has spoken and written far worse for me than I of him. Why ignore the police this totally proven? "Anders Behring Breivik sympathizer." "Should they wanted a" desire opponent ", then Jan Kåre Christensen" perfected ". Moreover writes Torp that I'm dirt, stalker, totally unintelligent, a Nolde "hat blogger", idiot, demon, desire lies, vile blogs, outcasts who lack the mind of Christ, ordinary judgment and social intelligence. 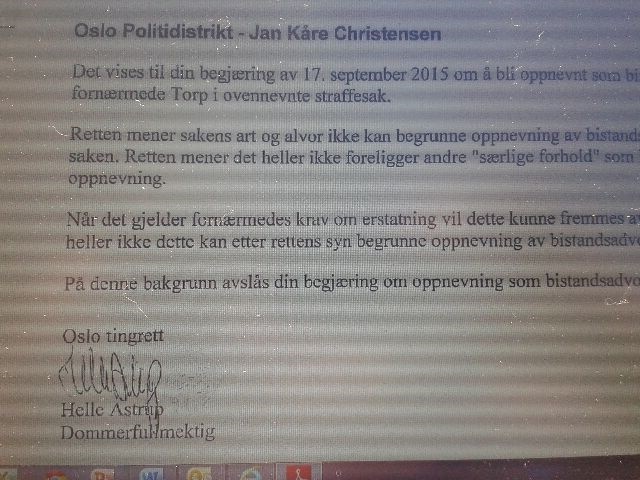 The rumors JKC and the truth is his understanding of English and Norwegian rather limited too! About the Heavenly blog, "who are confused, naughty, evil and stupid - through and through. It should be shut down, short and well. He also writes this about the Heavenly blog: "Jan Kåre Christensen u-Heavenly blog!" That said, no one must go through in life. But when I supported a friend of mine who Torp wondered 1.5 Million of, his had welcomed me almost perfect! This person wrote on a religious vow that he would give his apartment to Jan Aage Torp and Oslo Church, who did this in good faith. Torp called him if he could take out a loan on the apartment before it was sold, and this person did this. Not long afterwards had Torp a new Mercedes. When he sold the apartment and gave the rest of the money, it was a new Apostle seminar organized by Torp and Oslo church. How could I have continued to dig and dig, and "well" are inexhaustible almost regarding Torp. I have written about him and Reidar Hjermann. Torp meant that it was quite all right to give the kids a little spanking would Hjermann take him who was then Ombudsmen. Then had Torp heard a voice that said he and Oslo church should not be registered under the county. This voice has now changed? Now it says on the front page that the Oslo church under the county. These voices Torp hear all the time is also on the first page that it is "so-called" prophesied over Torp that he shall have God's blessing and protection over their families etc. It is then strange that just lost in-laws house on fire, I think that was rather a cautionary finger from the Lord than God-called protection. These voices Torp and many of today's Pentecostal Charismatic Christians hear witnesses more about a very sick mental life than that they walk with God and live in His grace and love! Here I stop for me and Jan Aage Torp for this time. Hopefully for a good time, that the police take to wit, and putting the whole affair!